After another wonderful night sleeping in a soft bed, we checked out of our guesthouse and took a taxi over to our new hotel near The Forbidden City and Tiananmen Square. We're pretty satisfied with our new "digs"--the location is much better than the guesthouse, but the room is soooo much smaller--we're kind of walking sideways around each other. But it's good enough for us--and it's free because we used points! We quickly unpacked a bit then headed out to find some lunch. Our plan for the afternoon was to visit The Forbidden City, but since it covers such a huge area we thought we'd better get some lunch first. 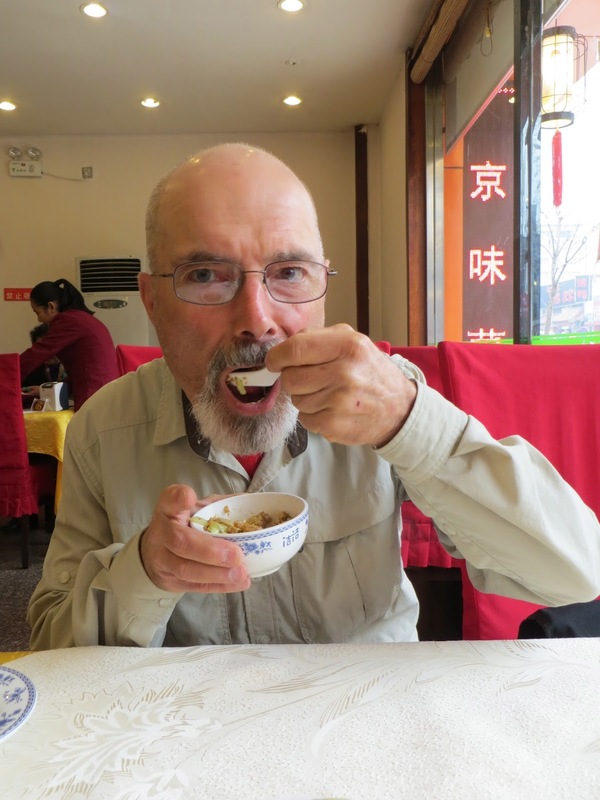 We walked towards the Forbidden City and stopped at a small restaurant along the way. We managed to order without too much confusion, but were surprised by the food that was set in front of us. The stir fry with celery was pork--but it was actually very fatty bacon! We managed to chew just a few small bites of meat off of the fat, and the celery was very good. We had also ordered fried rice--so we mixed it all together and filled our tummies! We continued on towards The Forbidden City, and after a few turns we found the admission gate. Hmmmm-it didn't look too busy, and the ticket counter was emplty, so we started to walk around to the south entrance. Soon we noticed that everyone else was walking the opposite way. 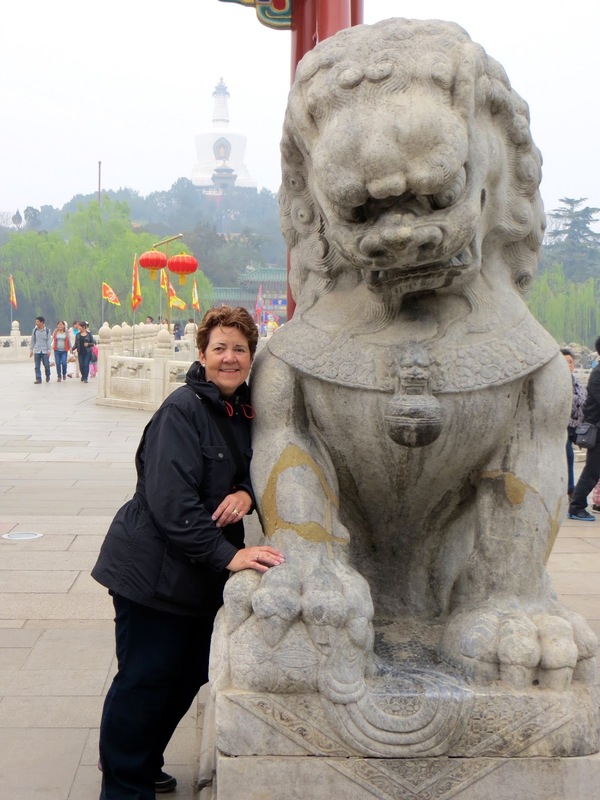 We asked someone coming our way--and she nicely explained that The Forbidden City is closed on Monday afternoons--darn! Well, we're pretty flexible, so we got out our trusty map and our "Top Ten Beijing" to look for something near us. 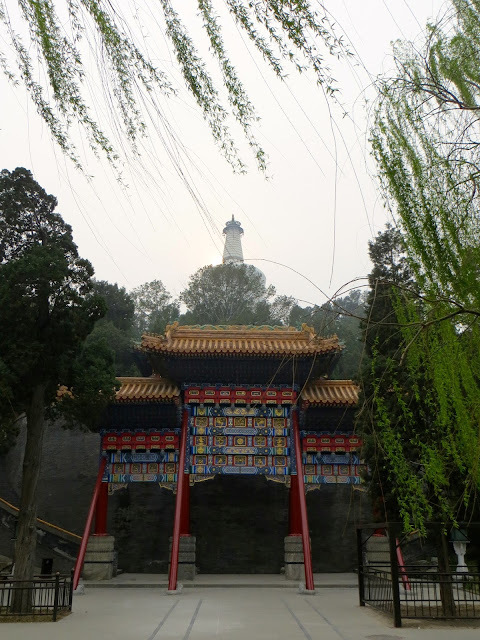 We found two parks, and both had been on my list of "must-sees", so we kept walking until we came to the entrance gate for Jingshan Park. This park dates to the Ming Dynasty, and though it is now a public park it was once an Imperial Park. 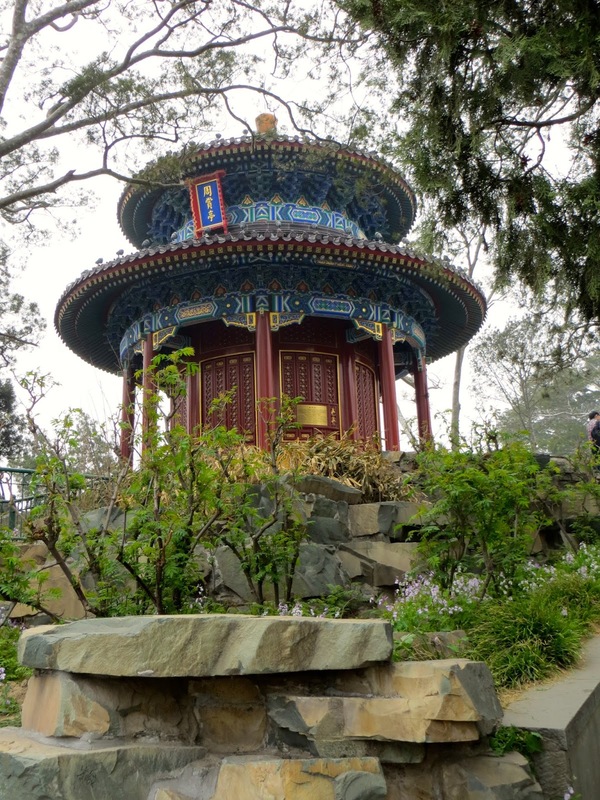 The park consists of 5 large hills, each topped with a pretty pagoda, pavilion or temple. 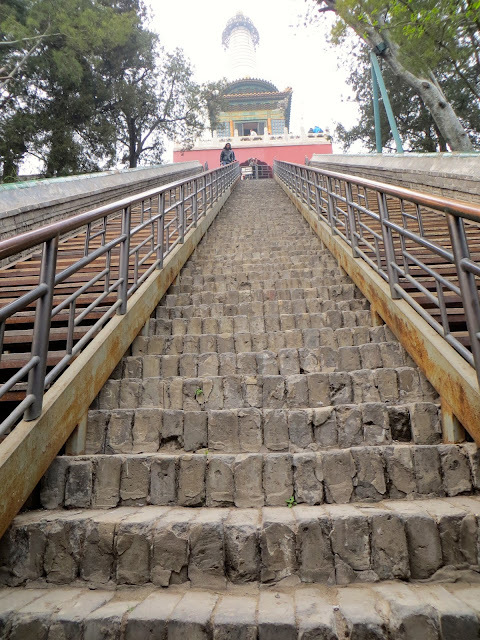 Jingshan Park including these 5 hills, was built entirely from dirt excavated from the moat around The Forbidden City. 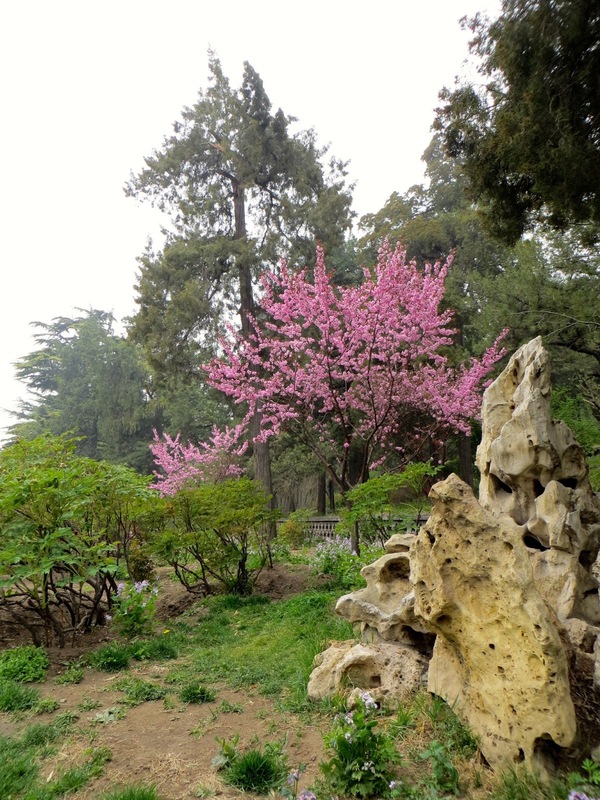 Jingshan is a very pretty park, and seemed to be quite popular with the locals. It was beautifully landscaped, and a few cherry trees were starting to bloom. Of course, we climbed all 5 hills to see the temples! The view from the top of the tallest hill was very nice--we could see into The Forbidden CIty. We would have had a really good view into the city if only it wasn't so smoggy today! We stopped to take a photo in front of some pretty blooming trees, and asked a nice young lady if she'd take our picture. Just after she snapped our picture, we dropped the small plastic connector for our tripod--and it went right under the boards on the viewing platform! Soon her whole family was down on their knees, helping us look for it. We never found it, but how nice of them to help us look. We ran into this lovely family several times in Jingshan and Beihai parks, and each time we traded photos. More new Chinese friends! Here we are again-photo taken next to an historical picture of Chang Kai-Shek taken on this very spot. Our new Chinese friend explained that it was very important that we have our picture taken here! 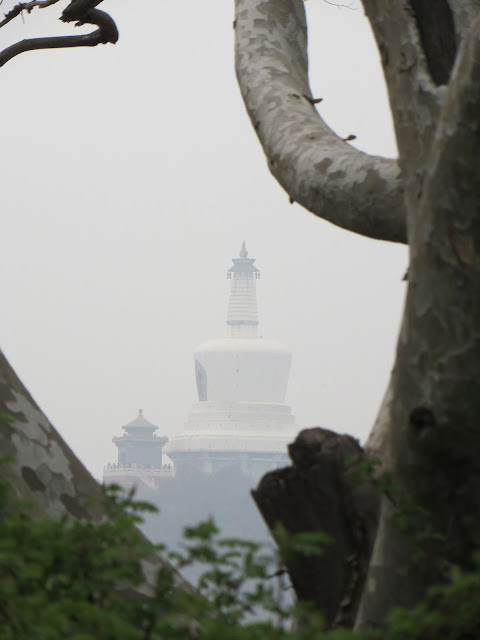 We walked all around Jingshan Park, and while we were up on one of the hills we saw a tall white stupa on a hill off in the distance. 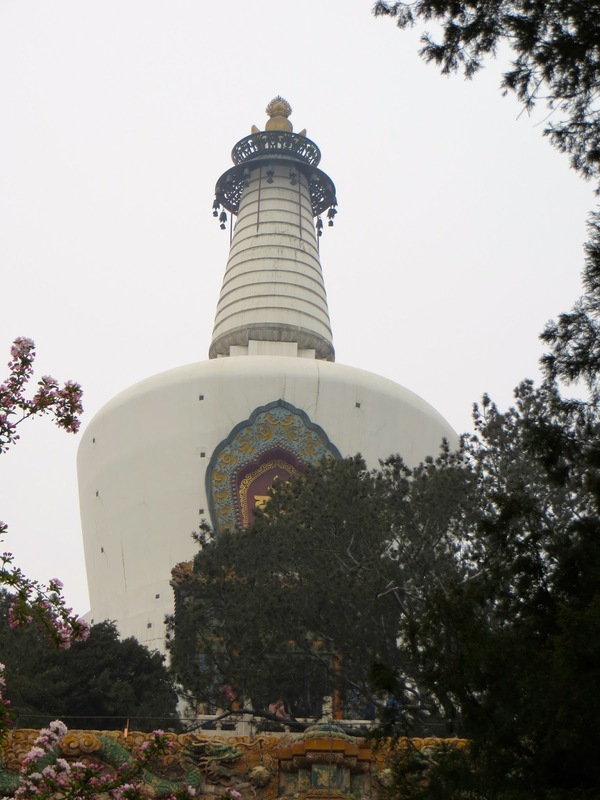 After consulting our map, we realized it was "The White Pagoda" in Beihai Park, so of course we thought we should climb up that hill, too! 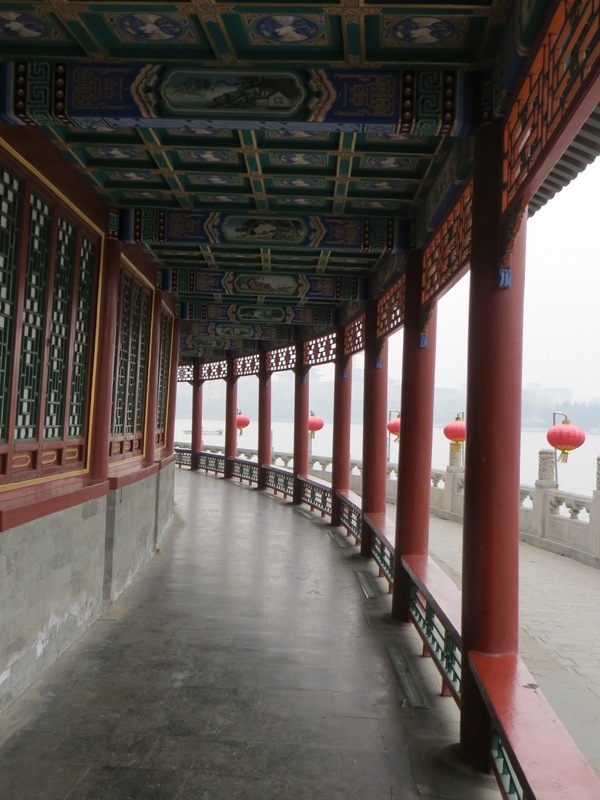 We found our way to the entrance of Beihai Park, paid the small admittance fee, walked in and across the small bridge near the entrance. 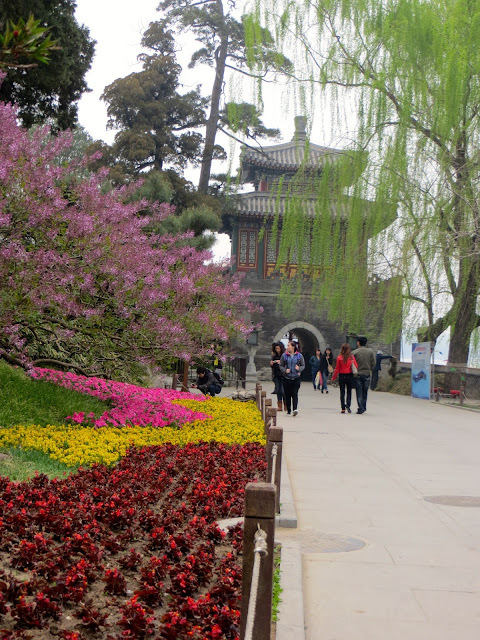 Beihai Park was first built in the 10th century as an Imperial Park, and has been a public park since 1925. What a beautiful park this is--the landscape design is amazing, with many bridges, canals, lakes and islands. There were many blooming trees--cherry and plum trees, magnolias and forsythia. Everywhere we looked there was yet another stunning view, garden or pavilion. We wandered the pretty paths, stopping to take photos, enjoying watching the locals practice their tai chi, play cards with friends and walk with their families. So peaceful...a nice respite from the busy hustle bustle of Beijing. Of course, we climbed up the tallest hill to the White Pagoda. I think our new travel motto is: "If it has steps, we will climb it!" Again, the view would have been wonderful if not for the nasty smog today. After all our wanderings, it was now close to 5 p.m. park closing time, so we walked across one last beautiful bridge and out of the park. This gate led to an interesting small hutong neighborhood, full of lively shops and bustling with activity. We walked to a main road, hoping to catch a taxi back to our hotel, but no such luck. 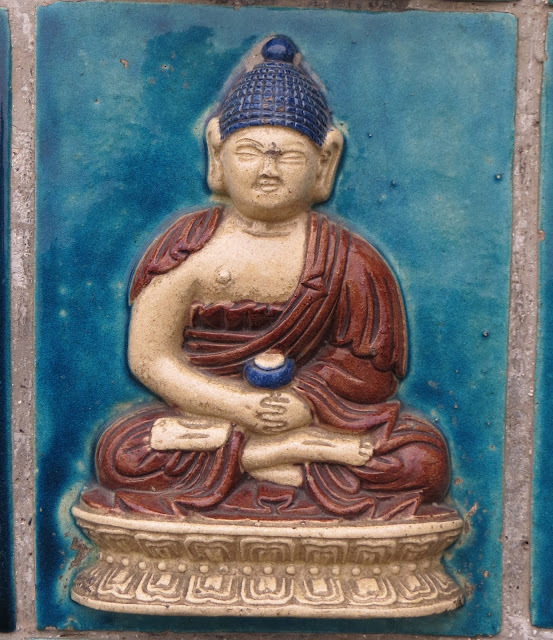 We popped into a small teahouse to rest our weary legs and enjoyed a cup of tea, then back out to the streets. The walk back really wasn't too bad, and soon we were "home". We'd walked miles and miles today, and despite our last minute change of plans we really enjoyed our time in the parks. 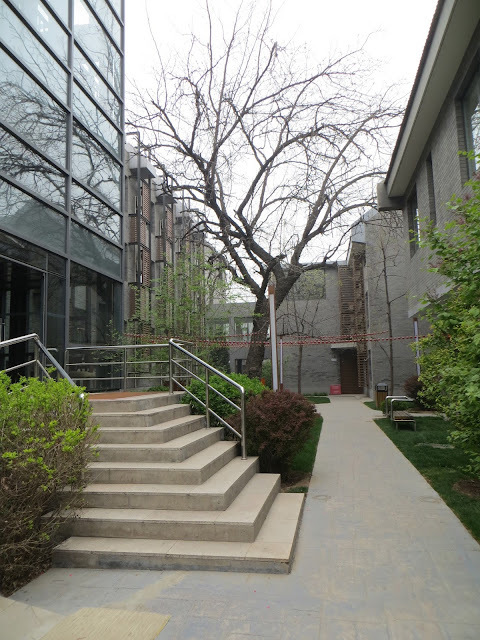 It was a perfectly lovely day in Beijing. We were both just plain tired after all that walking, so we decided we'd have dinner at our hotel restaurant as I'd read some good reviews. The menu wasn't the best, and the prices seemed a little high, but we were too hungry and tired to go somewhere else. We ordered some sweet and sour pork, fried rice and corn with pine nuts (weird combination, I know!) and settled in for the looooong wait for our food. Finally--food! But what a disappointment--absolutely the worst meal of our trip, and it was the most expensive! We managed to eat a bit of it--at least the corn was good. We paid our big bill, almost $35. I don't think we'll be back! Despite our crappy and expensive dinner, it was a wonderful day in Beijing. 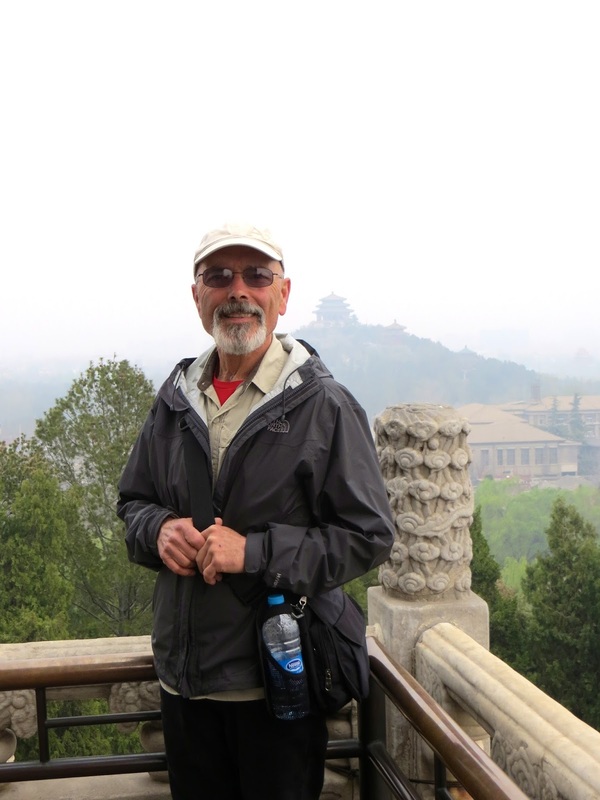 Tomorrow we will explore The Forbidden City--I'll check first to make sure it's open! Pat Grover Thanks for the update Di.....what fun.......sounds like I need to eat there to help my wieght loss program. Di Hi Mz Grover--Great to hear from you! Yes, the food HAS been a challenge--but I'm sure I won't lose a pound!